Built-in easel accommodates 4K sketchpad and positions it in a comfortable angle. Constructed of high-grade beech wood, this sketch box is sturdy and impact resistant. • Built-in easel accommodates 4K sketchpad and positions it in a comfortable angle. U.S. Art Supply Newport Large Adjustable Wood Table Sketchbox Easel, Paint Palette, Premium Beechwood - Portable Wooden Artist Desktop Case Premium Beechwood Solana Adjustable Wood Desk Table Easel French easel style designed sketchbox with a large storage box that converts into a painting easel. A natural wood colored desktop easel box that's oil finished. Made with hand sanded high quality aged Beechwood that's grown in Germany. Sturdy lightweight tabletop sketchbox easel that can be adjusted to any incline angle position depending on the need, and will accommodate a canvas up to 28". Includes a 17 well plastic painters palette. Keep Organized While Painting, Drawing and Sketching Storage sketchbox is divided into a 7 compartment interior with 4 removable dividing slats for adjusting comparment sizes. Store and organize sketch pads, paints, brushes, markers, pens, paper and other essential art supplies. It's deal for keeping yourself organized while painting, drawing and sketching. Easel is securely held together with metal latches and folds to a compact box with carrying handle. It's a durable user friendly art, studio and book stand easel that's great for use by kids, beginners, students, as well as for advanced artists and professionals. Easel Box Folded Dimensions 17.75" wide by 13" deep by 5.5" high, easel adjusts to 33" high. - Risk Free Purchase with our 100% Lifetime Satisfaction Guarantee. U.S. Art Supply is an industry leader in Art Supplies, so purchase our products with the confidence that we'll offer you a 100% lifetime satisfaction guarantee that if you're not happy with them at anytime, we'll provide a full replacement or refund. - Sturdy lightweight tabletop sketchbox easel that can be adjusted to any incline angle position depending on the need, and will accommodate a canvas up to 28". Includes a 17 well plastic painters palette. Folds to a compact box with carry handle. 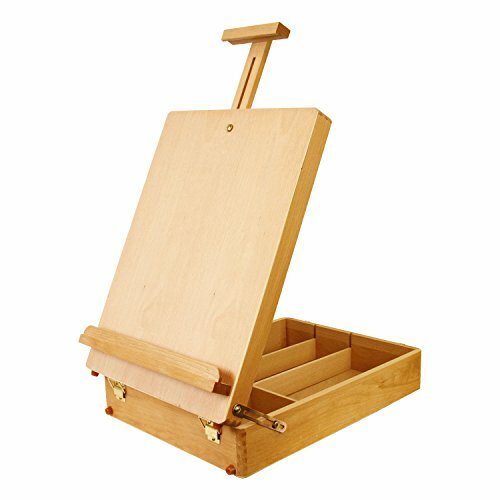 - French easel style designed sketchbox with a large storage box that converts into a painting easel. A natural wood colored desktop easel box that's oil finished. Made with hand sanded high quality aged Beechwood that's grown in Germany. - Storage sketchbox is divided into a 7 compartment interior with 4 removable dividing slats for adjusting comparment sizes. Store and organize sketch pads, paints, brushes, markers, pens, paper and other essential art supplies. It's deal for keeping yourself organized while painting, drawing and sketching. - Folded Dimensions: 17.75" wide by 13" deep by 5.5" high, easel adjusts to 33" high. It's a durable user friendly art, studio and sketchbox easel that's great for use by kids, beginners, students, as well as for advanced artists and professionals.